Like a thirsty person’s thirst does not get quenched by drinking more and more water, ALavandhAr is saying “I am his servitor, again and again”. Since nAthamunigaL‘s gyAnam, bhakthi etc are centered on achyutha, who does not abandon his devotees, such gyAnam, bhakthi etc will not be curtailed in himself and will gush in as a flood into samsAram (material realm) which is not an apt place to enjoy bhagavAn [as it facilitates material enjoyment only] – such is the greatness of his gyAnam and bhakthi. Again my salutations to nAthamunigaL who has incarnated in this world in the form of auspicious words overflowing from the ocean of unlimited devotion towards bhagavAn and true knowledge, who is the ultimate benefit, who is complete, who is having bhakthi yOga and is best among the yOgis. bhUyO nama: – Again salutations; as said in SrI bhagavath gIthA 11.39 “namO namasthE’sthu sahasrakruthva:” (I salute you thousand times). aparimitha – Unlimited as in the case of floods which reach everywhere. achyutha – Without limitation in qualities such as niyanthruthva (controlling ability), svAmithva (lordship) etc; also explained as unchanging [remaining the same in all circumstances]; another explanation – never slipping from the state of existing for his devotees; as said in thiruvAimozhi 3.5.11 “Arndha pugazh achchudhan” (one who does not abandon his devotees, being complete in his qualities) and in thiruvAimozhi 3.6.8 “naman thamarkkaru nanjinai achchudhan thannai” (one who does not abandon his devotees, being poison to the servitors of yama) – emperumAn will not leave his devotees to themselves or at the disposal of others. bhakthi thathva gyAnAnruthAbdhi parivAha Subhair vachObhi: – With the words of overflowing nectarean ocean of devotion and true knowledge. Since bhagavAn is the upAyam (means), gyAnam and bhakthi are part of enjoyable aspects and are unlimited. parivAha means the overflowing emotions in the form of words like water overflowing as flood. Subhair vachOpi – auspiciousness in the speech – as said in SrI rAmAyaNam kishkinthA kANdam 3.31 “avistharamasndhigdham” (the words that originate from the chest and throat of hanumAn, are in perfect meter, not too expansive, without any doubts and breaks and in proper pace). 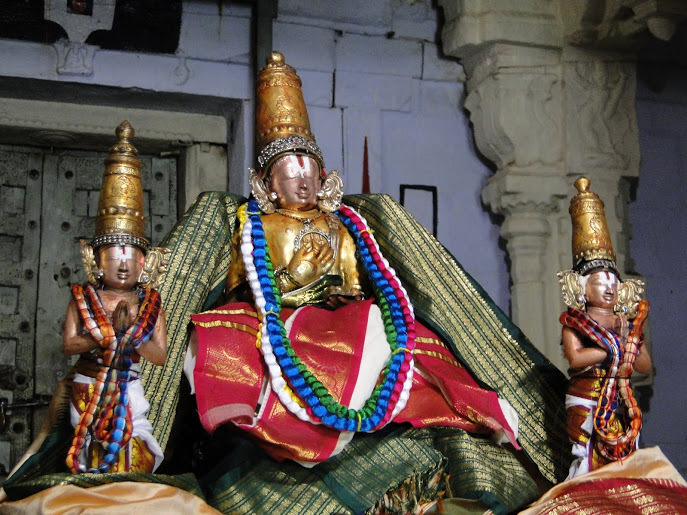 lOkE – In the samsAram which is a high plateau for bhakthi (devotion) to occur. As said in thaiththirIya bhruguvalli 9 “saishA bhArgavI vAruNi vidhyA | paramE vyOman prathishtithA ||” (this knowledge was explained by bhrugu to varuNa; it remains fixed in paramapadham), the bhakthi which is well established in paramapadham, is distributed in this material realm as said in thiruvAimozhi 7.5.1 “nAnmuganAr peRRa nAttuLE naRpAlukkuyththanan” (transformed the people of this world created by brahmA, to be situated in goodness). avathIrNa – The incarnation of devotees is also similar to incarnation of bhagavAn, which are meant for real uplifting of others. paramArtha – being the ultimate benefit. samagra – being complete as said in thiruvAimozhi 10.10.10 “adhanil periya” (greater than everything). bhakthi yOgAya – having bhakthi. Here bhakthi and thathva gyAna are indicated by the word bhakthi yOga since they go hand in hand. yaminAm varAya – As said in thiruvAimozhi 3.8 “mudiyAnE” decad, being the leader of those who have their senses exclusively focussed on bhagavAn only; one who is pursued by those who are as said in mudhal thiruvanthAdhi 11 “vAy avanai allAdhu vAzhththAdhu” (My mouth/speech will not glorify anyone other than emperumAn). This entry was posted in Other, rAmAnusa nURRanthAdhi, sthOthra rathnam on December 16, 2016 by Sarathy Thothathri.